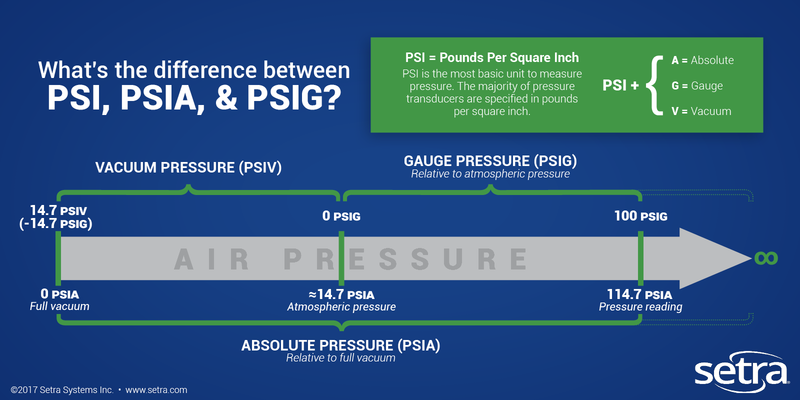 What's the Difference Between PSI, PSIA & PSIG? 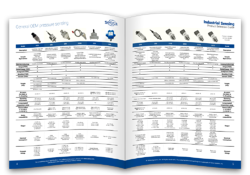 Pounds per square inch (PSI) is a common unit of pressure used in many different pressure measuring applications. It’s typically used for non-SI industrial and technical purposes such as tire pressure, fuel storage & distribution, waste water management, and test & measurement activities, among many others. While other units are used for different applications (such as inches of water column, Pascals, Bar, Torr, inHg, etc. ), the terms absolute and gauge are universal. For the sake of demonstration, this article will use PSI. 27.7076 inches of water column. Absolute pressure is measured relative to a full vacuum. The pressure of a vessel completely void of any air molecules would be 0 PSIA, while average atmospheric surface pressure (at sea level) is roughly 14.7 PSIA. Barometric pressure is measured on weather stations and data buoys using absolute pressure sensors; the data gathered by these sensors helps meteorologists track and predict severe weather like hurricanes and typhoons. SETRA BLOG: Why it’s important to measure barometric pressure accurately. Gauge pressure is measured relative to ambient atmospheric pressure. A vessel completely void of any air molecules (at sea level) would be roughly -14.7 PSIG, and ambient air pressure is always measured as 0 PSIG, regardless of whatever current barometric pressure is. For this reason, barometric pressure sensors are absolute; if a gauge sensor was used to measure barometric pressure, that sensor would be useless! The recommended pressure for the tires on your car is most likely around 32 PSIG. Other factors such as barometric pressure and outside temperature can affect how inflated those tires appear, even though the number of air molecules in the tire remain the same. Most industrial applications measure gauge pressure, including engine test stands which measure oil, fuel line, and coolant pressure on OEM prototypes for cars, trucks, construction equipment, and airplanes. Did you know pressure sensors are also used in hydrogen fuel cells? CLICK HERE to learn more about how fuel cells work.